For more people, the double chin is a difficult area to get rid of, even when losing weight. Kybella double chin treatment – derived from deoxycholic acid, a substance found naturally in the body – is used to improve this moderate to severe submental fullness. Kybella is a great alternative to invasive procedures (such as liposuction). It is quick, non-invasive, and requires no downtime. Contact us below to learn more about how we can reduce double chins with Kybella, or submit an online consultation form to get started. 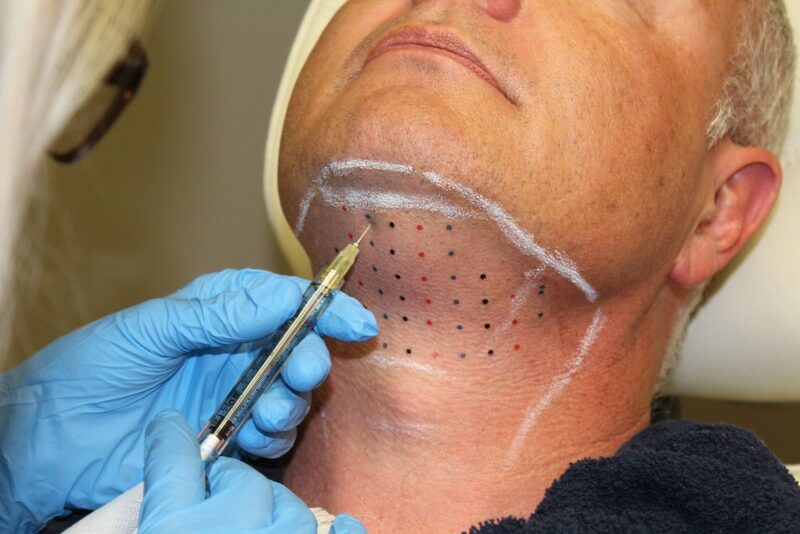 Small injections are administered into the fat of the submental region under the chin. Only minimal discomfort is experienced. Typically, multiple treatments are required, spaced 1 month apart. Complimentary consultations are available to discuss the estimated amount of Kybella needed, as well as a general estimate of the treatment cost. Avoid aspirin, Advil, Aleve, and fish oil for 1 week. Ice and take anti-inflammatory as needed. You can see improvement in 1 month, and the peak effect is reached in 2 months. For more information, please see the “Kybella consent form” in the box to the right. Our licensed skin care experts will work with you to minimize discomfort and/or side effects. These can be reduced by using ice packs before and after the procedure. Kybella is a safe treatment for both men and women over the age of 18 who do not have excessively loose skin in the neck and chin area. It is not recommended for pregnant or lactating women, or if there is an injection at the injection site. Costs are based on number of vials used.